Lesotho: Democracy reigns in Lesotho - but which democracy, exactly? THINK AGAIN: Democracy reigns in Lesotho - but which democracy, exactly? On 28 February, citizens of Lesotho voted in parliamentary and presidential elections. These were snap elections, called two years ahead of time, and were designed to drag the country out of the political and constitutional crisis which had left its government crippled for the last year. They were meant to signal a fresh start for Basotho democracy – and, from the perspective of most observers, they did. ‘Based on its observations, the [Southern African Development Community] Electoral Observation Mission [SEOM] concludes that the 2015 National Assembly Elections in the Kingdom of Lesotho were peaceful, transparent, credible, free and fair, thus reflecting the will of the people of the Kingdom of Lesotho,’ said South Africa’s Foreign Minister Maite Nkoana-Mashabane, who led the SEOM. South Africa’s Deputy President Cyril Ramaphosa, chief mediator in the negotiations that resulted in the election, concurred. ‘The people of Lesotho have spoken. The people of Lesotho have indeed indicated who should occupy the seat. Democracy has reigned,’ he said. Having witnessed it myself, there is little doubt that this was a free and fair election. Democracy reigned indeed, and – thanks to a cumbersome seven-party coalition – the party that received more votes than anyone else overall, and the most parliamentary seats, will lead government. Nonetheless, analysts have pointed to critical weaknesses in this new, democratically elected government that could plunge Lesotho back into exactly the kind of constitutional chaos from which it has just emerged. For one thing, the incoming Prime Minister Phalitha Mosisili does not have a decisive mandate from the people. And his majority is razor thin. His party, the Democratic Congress (DC), received just 3 551 votes more than the second-placed All Basotho Convention (ABC), and just one extra seat in Parliament – 47 seats, compared to the ABC’s 46. Mosisili is also forced to rely on six other coalition parties for his parliamentary majority; a delicate balancing which his predecessor, the ABC’s Tom Thabane, failed to maintain – although Mosisili, with 65 seats of 120 in his coalition, has a little more breathing room. Should any one of these parties cross the floor, Mosisili could find himself in exactly the same situation that Thabane did: unable to push through legislation, and facing a no confidence vote. The fragility of Lesotho’s coalition government begs the question: while the government may be elected democratically, is it the right kind of democracy? Researchers, analysts and particularly journalists have an unfortunate habit of using the term ‘democracy’ as a kind of catch-all expression to cover a number of different political and electoral systems. Generally, a popular vote is all that’s needed to satisfy ‘democratic’ criteria – although what exactly people vote on, and how those votes are taken into account, can differ dramatically between countries. Many countries, for example, hold two sets of elections to choose their government: one to elect the president or head of the executive, and another to elect representatives in a legislative body. The United States works like this, as, in Africa, do the likes of the Democratic Republic of Congo, Mozambique and Nigeria. This approach can be refined even further: sometimes, if no presidential candidate receives more than 50% of the vote, a run-off election is required between the top two candidates. This ensures that whoever ends up as president has a decisive mandate from more than half of the electorate. Other countries adopt the Westminster or Parliamentary system, whereby citizens choose a Parliament and Parliament chooses a head of government from the members of Parliament (MPs). Usually, cabinet ministers must also be chosen from MPs. This system too has various iterations. In the United Kingdom (UK), the House of Commons is composed entirely of constituency seats – in other words, every MP is elected by and answers to a specific geographical area. In South Africa there are no constituency seats in the National Assembly, the composition of which is determined entirely by proportional representation – in other words, seats are allocated according to each party’s share of the national vote. Lesotho’s electoral system, the mixed member proportional system, is something of a hybrid of the Parliamentary model. The National Assembly is composed of 120 members: 80 members who are directly elected from constituencies, and 40 members who are elected through proportional representation. In theory, this is the best of both worlds, as it ties members to specific areas, and therefore makes them accountable, while also reflecting each party’s national popularity. 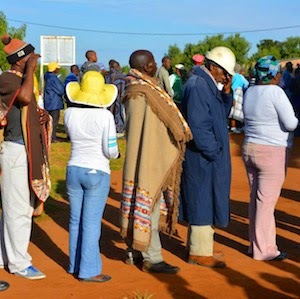 One of its major advantages is that all parties with a reasonable amount of support can secure a seat – in Lesotho, this translates to just a few thousand votes. This, however, can also be a disadvantage, as it makes it difficult for any party to secure an absolute majority – a particular problem for Lesotho. Another disadvantage is that Lesotho’s electoral system, like that of the UK, does not impose term limits on prime ministers, meaning that Mosisili (or a successor) could run for as many terms as he wishes. Mahao’s point is that coalition governments are inherently fragile, and that Lesotho’s political parties aren’t yet mature enough to manage them effectively. This is a recipe for instability. Nonetheless, it might just be the best recipe Lesotho has. ‘The mixed member proportional system makes the most sense for now, in the context of Lesotho’s history of post-election violence,’ said Dimpho Motsamai, a researcher at the Institute for Security Studies in Pretoria. It’s hard to know exactly what electoral system is right for Lesotho, or how to get the parties to make the most of it. It’s an important question, however, and it needs to be asked more often – not just in Lesotho, but in every country where ‘democracy’ is meant to be the solution.